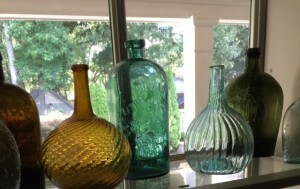 This entry was posted in Travel & Place and tagged antique bottles, car trips, collectibles, communication, marriage, relationships, road signs, spring, travel. Bookmark the permalink. The scene about rubbing his back and the cow/cow story!!! Love. Love. Love. Kristin, thank you for your sweet words. I am humbled by the opportunity to write alongside the fine writers on this blog. Lisa, I finished reading your piece with an enormous, contended sigh. I love what you *show* us about your marriage, without telling us. I love your attention to the many details that pass beyond your car window. And how did you get so good at writing dialogue? Mine always trips me up, so I tend to avoid it! Thank you, Jonathan, for your encouraging words. Hmm. Good question about the author’s detection—or not—of the calm in the eye of the storm. Life is fragile, and distance can increase the possibility of breakage. Your piece offers hope, though, as the journey progresses. By the end, I feel like those bottles are going to make it in one piece … your husband packed them with care. In fact, as I read, I see how each of you seems to take great care with everything traveling down the road in the SUV. Thank you, Ann. Yes, I experienced hope on the trip. The fragile can be sturdy.